Olinda Road. Courtesy Jim Lordan. UPDATE: Jan. 6, 5:30 p.m.
Maui Electric crews continued restoration efforts today and brought all customers back online with the exception of four customers in remote areas of Upcountry. Electric equipment servicing these customers suffered significant damage requiring additional repairs that will continue through the evening and in totomorrow. Jan. 6 UPDATE: Trees in lines off Kekaulike Highway resulted in the loss of power to approximately 1,400 customers in areas of Kula bounded by Kekaulike Highway. The area was isolated and power was restored to all customers at 11:24 a.m. Two customers remain without power. They will be brought back online once trees are cleared. 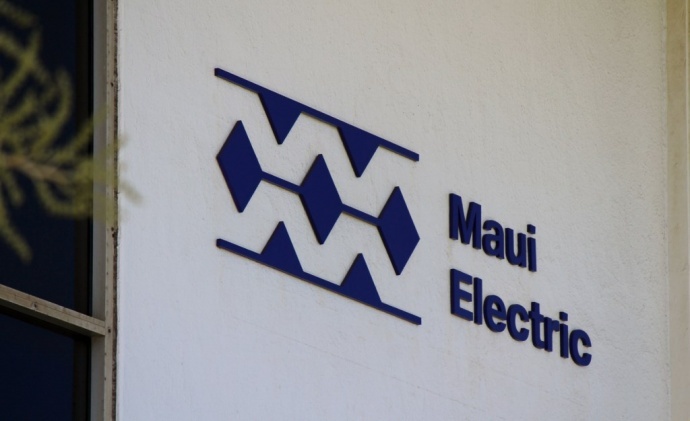 Maui Electric restoration crews made significant progress on Monday, Jan. 5. Less than 100 customers were still without power in pockets of Maui, including the upper Olinda, as of 4:30 p.m. today. 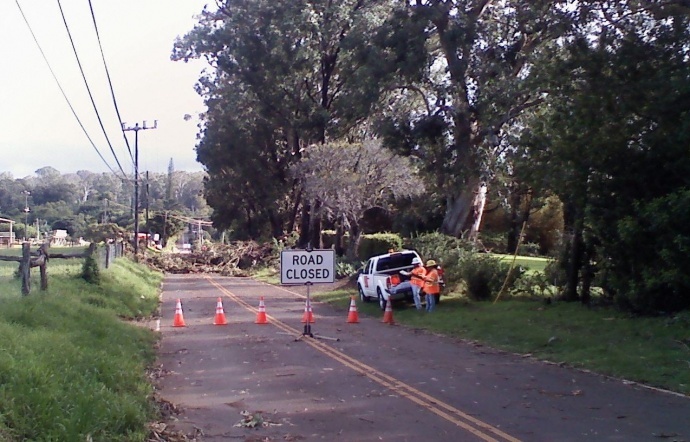 In East Maui, Keanae-to-Nahiku customers are expected to be brought back online by later this evening. In Upper Olinda and Pi‘iholo, customers can expect an extended outage into tomorrow as crews remain on-site this evening with tree trimmers to remove downed trees in order to access and repair downed electrical lines. Maui Electric crews continued restoration efforts in various parts of Maui throughout the day after strong storm winds brought down numerous trees on to electrical lines and wreaked havoc on Maui’s electrical system on Friday evening, Jan. 2. 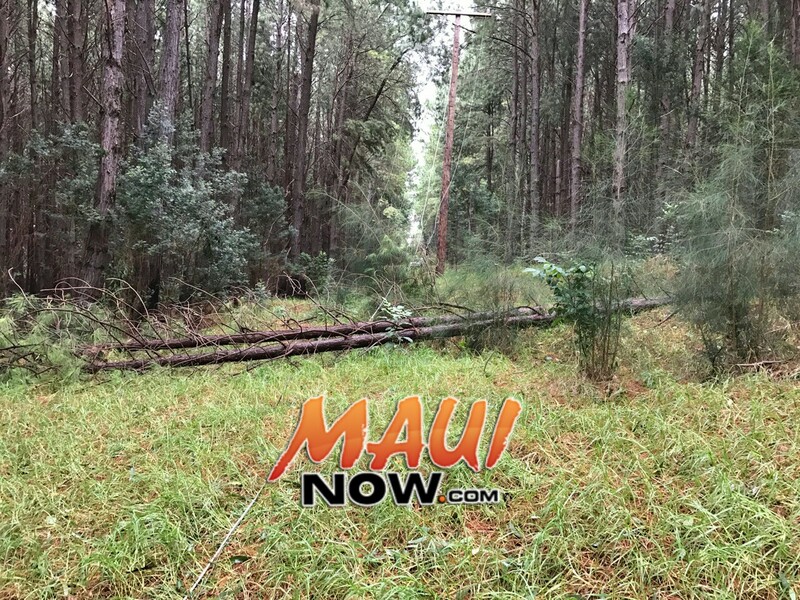 In Upcountry Maui, crews continued to work their way up Olinda and Pi‘iholo Road as tree trimmers cut downed trees blocking access to downed lines and electrical equipment. Once access was available, response crews replaced and repaired numerous cracked utility poles, transformers and conductors and restrung electrical lines that were extensively damaged during the storm. Crews will remain working on-site in the Upcountry area until late this evening and return first thing in the morning when working and lighting conditions are safer. 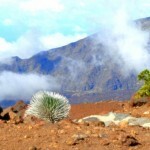 In East Maui, crews and equipment were flown into Wailua Ridge early this morning. They then hiked further in to repair lines and equipment throughout the day in order to bring the remaining 100 customers from Keanae to Nahiku back online this evening. The public is reminded to stay away from any downed lines or electrical equipment. Assume they are energized and dangerous. 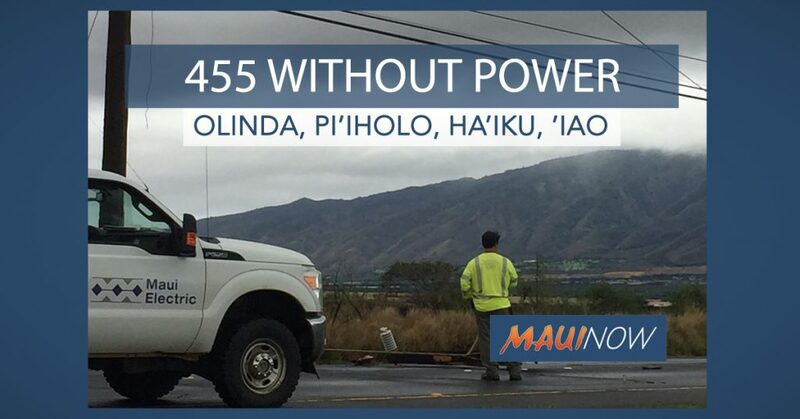 Report any outages, and/or downed power lines and poles on Maui by calling 871-7777. Moloka‘i and Lāna‘i customers should call (877) 871-8461.